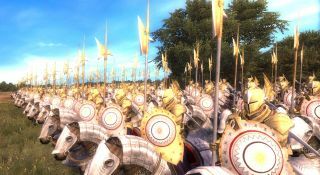 Despite the impending launch of Total War: Three Kingdoms, there are still plenty of reasons to return to the older games, especially Medieval 2 and its multitude of total conversion mods. Total War: Dragon Age is the latest attempt to turn BioWare's fantasy realm into grand strategy romp, and so far it looks very promising. A recent update from the mod team shows off the campaign map, specifically Ferelden, which you'll know doubt recognise if you've already spent hundreds of hours walking around the RPG version. You'll be able to visit places like the Temple of Andraste and Flemeth's hut, where unique events, items or even a high dragon can spawn. These special areas are one of a bunch of changes that the team is promising. Apparently, there won't be any part of Medieval 2 that won't be altered by the overhaul. Expect heroes, magic and scripted events like Blights, the Mage-Templar War and the Breach to crop up while you play. Along with being able to command one of the nations of Thedas, you'll also be able to play as factions like the Grey Wardens and Templar Order. Playing these smaller factions might be trickier because of their smaller unit sizes and slower recruitment, but they also boast elite armies and regular units that are better than average. Total War: Dragon Age doesn't have a release date yet, but the team is aiming to have a beta up and running within a year and a half. In the meantime, check out the ModDB page for more details and screenshots.